Manufacture real-scale, end-use parts in over 40 different materials. 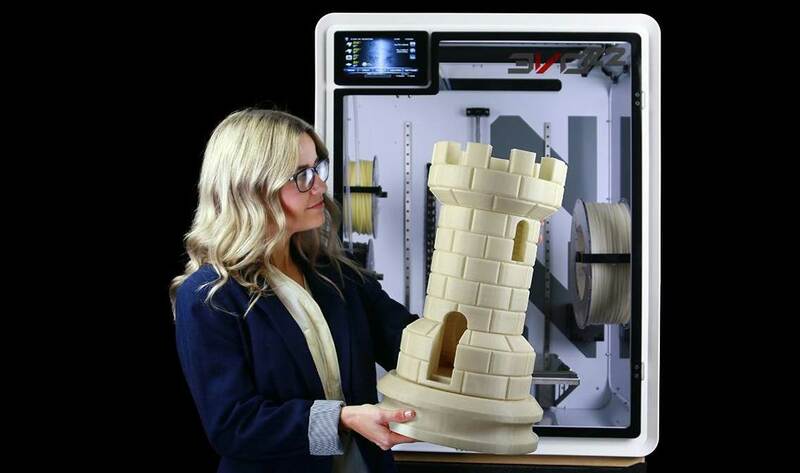 Optimized for large-part production, the 12 x 12 x 22.75-inch enclosed build volume is ideal for producing large parts using ABS, HydroFill Water-Soluble Support, polycarbonate, and more. Manufacturing large parts has never been easier, thanks to proprietary Tri-Heat™ technology. Two internal chamber heaters and a high-temperature heat bed create the optimal thermal environment for the formation of strong, smooth parts. Enjoy Airwolf 3D’s proprietary auto-leveling technology along with AutoPrime, and Sweep. Ultra-durable Extended-Life nozzles save time and money while providing higher precision, speed and efficiency. Breathe easy. An oversized air filtration system works to actively contain UFP and VOC emissions during the desktop manufacturing process. An ideal machine for school or smaller spaces. Gone are the days of losing hours of production time due to power failure, an accidentally unplugged machine, or other interruptions. Just turn your machine back on, and resume production where you left off. Print with peace of mind. Ensure that your print will continue, even if you run out of material or need to purge a clogged hot end. Simply place the print head where you left off and FailSafe™ will do the rest.